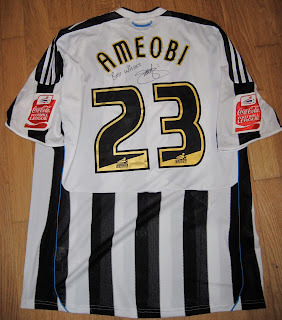 The shirt worn by Shola Ameobi that I've put up for auction in aid of the 2 charities is currently up to £485. That is a great current bid but I'm sure, that given it's for 2 great local charities and was donated by Shola himself, it can go for even more. The 2 charities in question are, of course, St Benedict's Hospice (Charity No. 1019410) and The Children's Foundation (Charity No. 1000013). St Benedict's Hospice recently launched an appeal to raise £400,000 to fund their "Hospice at home" service. At present the service is from 9pm – 8am when the palliative care team are on call and can visit patients at home. With extra funding it can be extended to 5pm – 8am avoiding an influx of calls at 9pm and will spread the visits over a longer time. This means that the patient has a choice of where they want to be cared for - in the hospice or at home and it means that they are covered 24 hours per day. Speaking from personal experience, this service would have been of great use to me and my Mam during the days when I cared for her at home. I can see how the additional help and the right expertise out of hours will be of great benefit to many people in the region. I've recently been learning about how The Children's Foundation are helping to make The Great North Children's Hospital a centre for excellence in children's healthcare for this region, similar to Great Ormond Street in London. The new children's hospital will be a fantastic resource, where children with life threatening and life limiting conditions from the North East and beyond, can receive the very best treatment. The Children's Foundation wants to make that time in hospital as comfortable and stress free as possible. They are aiming to provide world-class, high-tech facilities, activities and equipment to help aid a child's recovery. If you've never seen the hospital then I'd recommend that you walk past the RVI in Newcastle one day. It's a striking building that really stands out and catches the eye. I'm sure it will become quite iconic in our region once it fully opens. So I'm sure you'll agree that the money raised from the sale of this shirt will be put to great use by the 2 charities. Howay lads and lasses! Let's get bidding! Please click here to be taken to the shirt listing on eBay. Across the USA in 100 easy steps! This Saturday is a very important date in the Run Geordie Run calendar. It's May 1st, which means that there will be exactly 12 months left before I start the 3100 mile run across the USA. To give you all an idea of the scope and size of the run, I will be breaking that map of the USA down to each corresponding day on the run. So this Saturday, for example, I'll be showing the route from Huntington Beach in California. I'll be monitoring the temperature too to give you all some indication of the kinds of conditions I'lll be running in next year. That's going to make for interesting reading! It promises to be a fascinating day by day, dry run of the real thing next year and worth tuning in to read. Hopefully, by August 9th this year, everyone will have a good appreciation of the size and complexity of the task at hand. Taking time to reflect on progress made so far. Sometimes I feel the need to take a step back from all of the the training, fundraising and other preparation for the 3100 mile run across the USA next year. It doesn't happen often but this weekend is one of those times. Almost everything associated with the 3100 mile run is bang on schedule. I've saved 75% of the Tour Fund already and will soon be able to book flights, hotels and the transport. The remaining 25% will be for food, fuel, insurance and energy/recovery products. It's a significant sum of money but if I hit the £50,000 target for the 2 charities it will be well worth it. Some say the figure raised for St Benedict's Hospice and the Children's Foundation could be higher but I've set that target and I'm sticking to it (for now!). Given that I've got a day job and a family as well as going to the match I'm very pleased with the training so far. I'm building the mileage up nicely and I'm on target to run 32 miles a day for 7 days in training by mid August. I've got a few thousand miles under my belt for this training campaign with very few injuries. I've always viewed this physical resilience as one of my assets and I'm confident of being able to run 3100 miles in 100 days as a result. Lets not forget that I've also got the coaching and mentoring of David Fairlamb and Mark Fleming on my side. Way back in August 2008, I quoted a certain Theodore Schumann as saying "In order to grow in your field, you need a voice that understands where you're coming from and what your goals are. A mentor provides the wisdom you haven't yet achieved, or the motivation you need to take bold action. While you won't always agree with your mentor, you will learn to appreciate all he or she teaches you.". These words pretty much sum up the relationship I have with David and Mark. I've always been a great believer in surrounding myself with the right people. Make no mistake, these two guys are the right people. I've got no doubt that they will be one of the key factors that will help bring about a successful run across the USA in 2011. One of the main sacrifices during this training campaign is the time I spend with friends and family (other than Katy and Jack of course). I know that training for this run hasn't gone down very well in some quarters with remarks such as "I don't know why you're doing it, you're wasting your time. ", "You've become very self centered. ", "If you're not careful, you'll end up with nothing and no one." and "You will get some glory and recognition for a while but how long will that last?". I think some people have missed the point with those comments. The "glory and recognition" can last until the end of the run as far as I'm concerned. It's the financial gain that the 2 charities will have that is the most important thing. Don't forget that I was the sole carer for my poor Mam as she fought the battle against lung cancer. I was 23 at the time when she died and, without the help of the doctors and nurses at St Benedict's Hospice, she would have suffered much more than she did at the end of her life. As a 23 year old back then I vowed to repay the debt of gratitude towards the Hospice for as long as I could. Well, 16 years and over £50,000 later I'm continuing to say thank you to St Benedict's Hospice in whatever way I can. So, how dare people say that I'm wasting my time. How bloody dare they! This is the first and the last time I've ever written words of this nature on this blog. Moving swiftly on! The fundraising aspect of the run could not have gone any better so far. It's amazing that £9,163.20 has been raised already, despite the run being 12 months away. While it's amazing, though, I'm not one bit surprised. Over the last 16 years, I've come to realise just how generous people are. Not just in our region either. I've taken donations from all over the world and from many exiled Geordies. Back in December 2009 I said on this blog that "I'd like to think that, by next Christmas, the fund will have nudged close to £15,000". Well, with just over £4,000 added to the total already since then we are well on the way to hitting that milestone. I don't take anybody's generosity for granted, though, and will be working and training extremely hard to raise that sum of money this year. Another pleasing aspect of the run is the publicity side of things. It's no coincidence that since nufc.com got involved the charity fund started to grow quickly and a lot more people became aware of the run. I've now got people who sit in front, to the side and behind me at St James Park who've all made donations or bought a Run Geordie Run t-shirt. I meet people all of the time who say "Oh yes, I've seen you on nufc.com". The Peter's Pies and Adidas sponsorship were both as a result of nufc.com. Appearing on nufc.com is something else I don't take for granted and I'm extremely grateful for the quite outstanding publicity they give to Run Geordie Run and the 2 charities. Especially, when there are so many people out there doing similar sponsored events for so many different worthwhile causes. 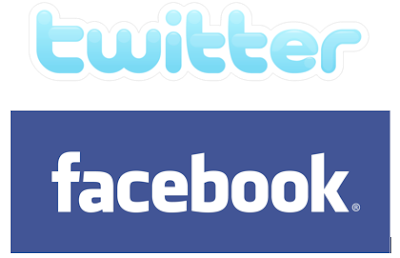 Another place that I've found very useful for spreading the word about the run is Twitter and Facebook. Both of these social networks have brought about fundraising opportunities that would not have otherwise been possible. I've talked to some pretty amazing people on there and Run Geordie Run has built up quite a following with 2450 followers on Facebook and 500 followers on Twitter. Not to mention the sub groups on there dedicated to the Peter's Pies run and one for fans of the Run Geordie Run t-shirt! Yes, even the t-shirt has it's own group. Publicity for the run has been seen on Sky Sports News and Tyne Tees TV. I've been heard on Real Radio and BBC Newcastle. People have read about the run in The Evening Chronicle, The Journal, The Mag (watch out for me in this month's Summer Special) and numerous other publications and websites. There is also a pending appearance of the promotional video that is currently under production on the popular TVCatchup.com. 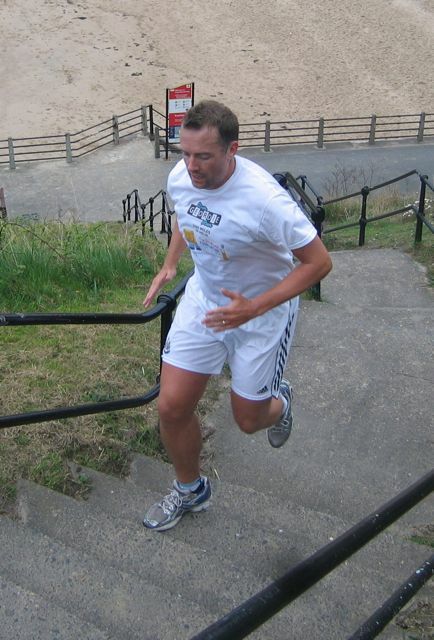 All in all, a lot of people should be aware of Run Geordie Run by the time I set off from California in 2011. Over the last few weeks, I've had words of encouragement from some of the players from Newcastle United, cyclist Mark Beaumont (whom I admire greatly by the way! He's one of my heroes! ), Amir Khan, Iwan Thomas and Ben Shephard who said "Mark this is an incredible challenge. I will follow and support all I can! Good luck mate". I've since been invited to run the 145 mile Coast to Coast route with Ben and Ivan Hollingsworth in July. I'll let Ivan and his wife Nadine explain what that's all about. "On the 11th January 2009 we were blessed by the birth of our beautiful son Sebastian. The dream quickly turned into a nightmare as 15 hours after his birth Seb was diagnosed with a congenital heart condition called Tetralogy of Fallot which if left untreated would mean he wouldn’t see his 2nd birthday. Seb started to become ill earlier than expected and at just 4 months old the decision was taken by the surgical team at the Freeman Hospital to perform emergency surgery. After 6 hours in theatre, a rollercoaster week in Paediatric Intensive Care Unit (PICU) and 4 weeks on Ward 23 we finally got to take our boy home. Touch wood, Seb is doing really well, and we are all praying that he will not require any further operations....not till he is much older at least. The events of this year have spurred us into fund raising mode. As like so many other families that have passed through the doors of the Freeman Hospital, we want to show our gratitude in any small way that we can; let’s face it, nothing we do can say THANK YOU enough for saving our son’s life!". To be asked to join them on the run is an absolute honour. It's great to hear that their story had a happy outcome and that little Seb is doing really well. The Freeman Hospital is, indeed, a wonderful place where modern day miracles happen. I hope to gain a lot of inspiration from Ivan, Nadine and Seb's story. Like me, they seem to have a burning desire to show their gratitude. I could go on talking about the many other aspects of the run but I think I'll leave it there for now. I'm sure you'll agree that most of the building blocks are being put in place for a successful 3100 mile run across the USA next year. I'm more than happy with many aspects of the run. The final piece of the jigsaw is to get my weight down to the required level. I've got to say that running over 100 miles in training is easy compared to eating properly. If I don't get this long standing problem of nutrition right, though, I will suffer even more next year. Sunday 18th April 2010 - 10.5 mile run, Peter's Pies 6 Tyne Bridges Challenge. (01:50:47). Wednesday 14th April 2010 - Personal Training Session. (01:30:00). This signed, match worn shirt was given to Northern Rock by Shola Ameobi to auction off in last year's annual Christmas charity auction in aid of CHUF (Children's Heart Unit Fund). I was lucky enough to win the shirt and have made the very difficult decision to put it up for auction in aid of the 2 charities. I love Newcastle United and I love collecting memorabilia but parting with this treasured item seems like the right thing to do if 2 local charities can benefit greatly from it. Please bid generously folks and rest assured that ALL PROCEEDS from the sale of this shirt will be split equally between St Benedict's Hospice (Charity No. 1019410) and The Children's Foundation (Charity No. 1000013). That's exactly how we like to do our fundraising at Run Geordie Run! Also included is the original brochure from Northern Rock's auction with details of this lot. Please click here to be taken to the auction. Thanks to a surge in t-shirt sales today, the charity fund has burst through the £9,000 barrier and currently sits at £9,103.20. All of a sudden, the sacrifice of quitting my job next year and spending 100 days away from my family is starting to make sense. The sacrifice when compared to the benefit the charities are going to get from these funds is very small indeed in my opinion. The 3100 mile run starts in just over 12 months time. I really can't begin to imagine what the charity fund will be by then or indeed by the time I reach New York in August 2010. The generosity of so many people from all over the world never ceases to amaze me. It was the generosity of my colleagues at Northern Rock today that helped move the fund to it's current high level. T-Shirts have been "flying off the shelves" and have now contributed almost £4,000 to the overall total of £9103.20. That's $13,993 USD for the overseas readers! Once again I must also thank Peter McCowie for paying for the production costs and customplanet.co.uk for making the t-shirts at cost price. In the meantime, if anyone could think of a caption for this photograph please get in touch at sponsorship@rungeordierun.com. If you would like to order a t-shirt as worn by Coca Cola Championship Champions Newcastle United, please click here. The element of the charity fund for St Benedict's Hospice (Charity No. 1019410) passed through the £4,000 mark this afternoon. Sales of Run Geordie Run t-shirts have helped push the total up this week. The current total for The Children's Foundation (Charity No. 1000013) is £4,878.50 giving an overall charity fund total of £8,883.20. Given that the run is just over 12 months away that sum of money is quite amazing, with people from all over the globe contributing. I really do wonder sometimes how much money can be raised during the run for these 2 amazing charities. Thanks, once again, to everyone who has bought a Run Geordie Run t-shirt. I have been busy all week packing and posting them. The final ones from this batch should be posted on Monday. Watch out for them coming through your letterbox. Another good week for publicity. This week got off to a great start for Run Geordie Run when I was interviewed by Sky Sports news on Monday. They caught me just before I got on the bus to the Plymouth match. I said a few things in the interview, but the bit they broadcast went something like this: "Yes, It's a long way but if we get the 3 points to clinch the title it will be worth it". I was on local ITV news programme Tyne Tees Tonight at 6pm today. It's a canny little piece and was hopefully seen by thousands of people in the region. It can be viewed online here. On Wednesday I had a meeting with a company called Superkrush Films. They answered a request, via Twitter, for help in making a 30 second promotional video. This video will be shown to the 900,000 users of TVCatchup.com when they log in. TVCatchup is a brilliant service allowing access to freeview channels in the UK. I use the service regularly on both my iMac and iPhone. They have been incredibly supportive so far and the chance to showcase the run on their site using the talents of Superkrush films is a wonderful opportunity for Run Geordie Run and the 2 charities. As well as the 30 second promotional video to be shown on TVCatchup, Superkrush will be producing a longer piece for publication elsewhere. I had an initial brainstorming session with them yesterday and I could tell almost immediately that the end product is going to be very exciting indeed. Watch this space over the coming weeks as progress on the video is made. Both TVCatchup and Superkrush Films have my thanks and are providing all services free of charge. Why not click the logos above to sample TVCatchup for yourself and see how slick the sample videos are on Superkrush's website. I was interviewed just before I got on the bus to Plymouth this morning by Sky Sports. 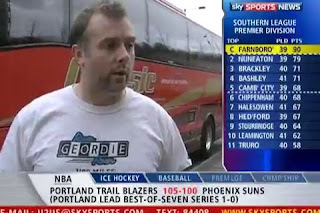 Look out for me and more importantly the Run Geordie Run t-shirt on Sky Sports News today. Run Geordie Run's T-shirt factory. The Run Geordie Run t-shirt packing team* have worked tirelessly this week to get all of the t-shirts packaged up ready for posting out. They are about 90% done and the first of many trips to the post office is scheduled for tomorrow. *The t-shirt team consists of my missus, Katy who puts the address labels on the packets, my 7 year old son Jack who puts together the required number and sizes of t-shirts for each customer and myself who puts the t-shirts in the envelop and ticks them off the very long list of sales! Jack has hinted at some extra pocket money this week but I'm treating him to the FA Youth Cup semi-final, 2nd leg at St James' Park tomorrow as thanks for all of his hard work. What a lucky lad! I haven't told him that it's only £1 for children to get in. He'd probably push his luck for a comic too if he knew that. To help save on postage, Katy and I will be hand delivering a few local orders. The ones to the USA and Australia will definitely have to be posted though! Thanks again to everyone who has bought a Run Geordie Run t-shirt. What a difference you have all made to the charity fund. At the time of writing, £8,653.20 has been raised in aid of St Benedict's Hospice (Charity No 1019410) and The Children's Foundation (Charity No. 1000013). For the benefit of my overseas readers that's 13,388.95 USD. I will get round to thanking everyone who bought a t-shirt this week via email very soon. Also, I've have a few emails from people asking various questions or offering assistance or advice. I will get back to you all asap. If you would like to order a t-shirt as worn by Newcastle United during the Blackpool pre match warm up, please click here. It gives me great pleasure to announce that sportswear giant Adidas are now supporting Run Geordie Run.Yes, it's true! I couldn't believe it when they approached me either! Adidas will be supplying various items of kit including the tracksuits, polo shirts, hoodies embroidered with the Run Geordie Run logo that I'll wear for media appearances and travel in the USA next year. They are also supplying base layer tops and shorts and some kit bags. Adidas were instrumental in getting the players to warm up in Run Geordie Run t-shirts before the Blackpool match last Saturday. I can't thank them enough for that and over £1200 has been raised so far from the sale of t-shirts this week alone! At the time of writing, the fund stands at £8,643.20. An application has been made to The Northern Rock Foundation to match £1000 of this week's t-shirt sales. Fingers crossed that the the charity fund will creep over £10,000 very soon. I'll leave you with a few words from my latest sponsor - "Adidas are sponsoring Mark Allison who is running 3100 miles next year in the USA on behalf of St Benedict's Hospice and The Children's Foundation. We hope Mark proves that "Impossible is nothing". 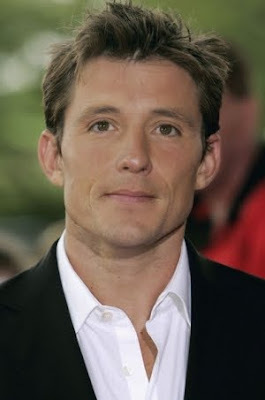 This is an incredible journey for Mark to take!". Whereeeeerrrreeereee has the t-shirt been this week (Part 9)? Whereeeeerrrreeereee has the t-shirt been this week (Part 8)? You can listen to my piece on BBC Newcastle's Total Sport programme by clicking here. It starts at about 01:19:30 into the show. evening between 18:30 and 19:00. 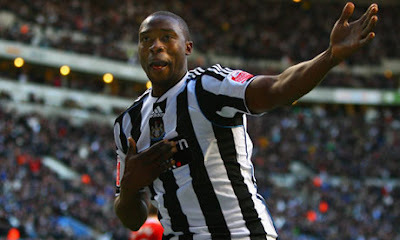 To say this has been a good week for Run Geordie Run is an absolute understatement!! Firstly, £1000 has been added to the Charity Fund in aid of St Benedict's Hospice and The Children's Foundation this week. This has come about through sales of Run Geordie Run t-shirts as a result of Newcastle United wearing them during Saturday's pre match warm up. The fund burst through the £8000 barrier on Saturday afternoon and currently stands at £8398.20. I can't repeat enough just how grateful I am to everyone for their donations. These donations have come from all over the globe. The USA, New Zealand, Hong Kong, France, Scotland and Australia are all represented on my sponsor form. Add to this list, donations from the North East and many other parts of the UK and you start to realise just how globally recognised Run Geordie Run and the 3100 mile run across the USA has become. News of the run is also reaching the celebrity/sports world too. I've had some kind words from GMTV's Ben Shephard, Olympic Silver medallist Iwan Thomas, The Times' North East football writer George Caulkin and those members of Newcastle United who I was able to chat to on Saturday. There was some brilliant coverage on Real Radio on Wednesday with sound bytes from yours truly played during the hourly news bulletins. On Thursday, I was lucky enough to be able to give a talk to the Rotary Club of Tynemouth. As a result, they are going to help spread the word throughout the Rotary Club movement. 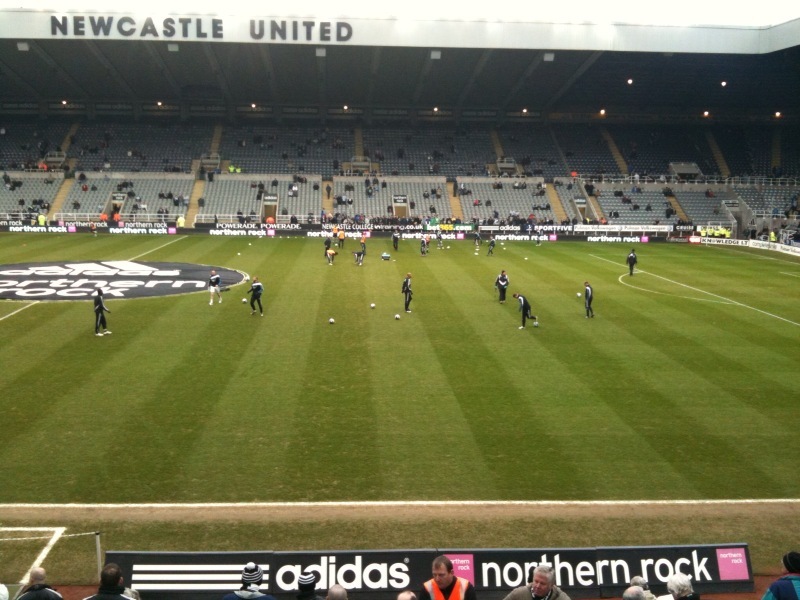 The final bit of PR came about on Saturday with an article in The Journal about the NUFC warm up. I was also very pleased with a subsequent mention in the editorial section. 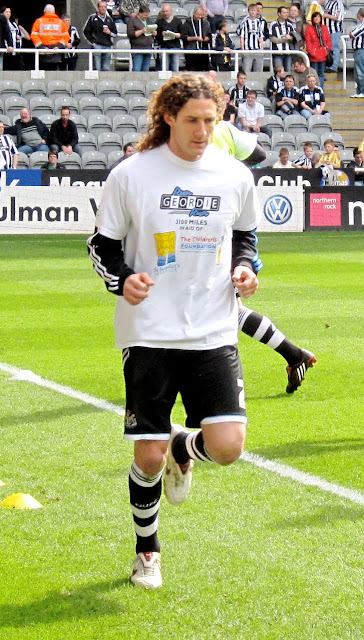 It went something like this: "What a nice gesture of Newcastle United to ask the team to wear T-Shirts in support of Mark Allison ahead of today's match at St James' Park. His ambition to run more than 3000 miles in just 100 days all for a good cause is a remarkably challenging one. But knowing he has the support of the region will spur him on to achieve it.". I should probably mention too, that the number of hits on www.rungeordierun.com passed 100,000. The site has been up and running since January 2007. The amount of traffic has increased steadily over the last 3 years. It's great to know that people actually read this stuff! Aside from PR there has been the small matter of running 16 miles per day this week. I completed the final run of the week after 11 pm on Saturday night! Despite having run much further during sponsored runs in 1 week that was a new record for a training week. The 112 miles I ran this week were made up of 4 x 16 mile runs and various other distances to get a daily mileage of 16 miles. The recovery between runs was probably the most pleasing aspect of the week with very few aches and pains experienced. I did feel very tired during the middle of the week and did suffer mild dehydration but other than that it was all good. Nutrition was almost spot on too. It's not my strongest point but I was never hungry on a run so that's a change from previous weeks. I found myself consuming quite a lot of energy gels, drinks and bars. They have cost a fortune and I dread to think how much I'll have to spend during the rest of this training campaign as well as during the run next year. If there's an energy/recovery bar/drink supplier out there who would like to sponsor me then please get in touch at sponsorship@rungeordierun.com. So I'm sure you'll agree, that this has been a very successful week on and off the pitch for Run Geordie Run and the 2 charities. I'll be spending most of the next week packing and posting t-shirts to all the four corners of the globe and replying to the numerous emails that I've received asking questions about the run or sending best wishes. Good times! Sunday 4th April 2010 - 10.5 mile run, Peter's Pies 6 Tyne Bridges Challenge. (01:40:01). Sunday 4th April 2010 - 5.5 mile run, Shotley Bridge to Ebchester and back. (00:54:03). Monday 5th April 2010 - 16 mile run, Shotley Bridge to St James Park. (03:04:19). Tuesday 6th April 2010 - 16 mile run, Shotley Bridge to Rowlands Gill and back. (02:48:23). Wednesday 7th April 2010 - 8 mile run, Gosforth tour. (01:29:07). Wednesday 7th April 2010 - 8 mile run, Treadmill. (01:25:49). Thursday 8th April 2010 - 16 mile run, Gosforth tour. (03:11:48). Friday 9th April 2010 - 16 mile run, Gosforth to Ebchester. (02:58:55). Saturday 10th April 2010 - 6 mile run, Treadmill. (01:12:13). Saturday 10th April 2010 - 10 mile run, Shotley Bridge to Hamsterley Mill and Back. (02:13:50). Whereeeeerrrreeereee has the t-shirt been this week (Part 7)? If you would like to order a t-shirt as worn by Newcastle United during the pre Blackpool match warm up, please click here. 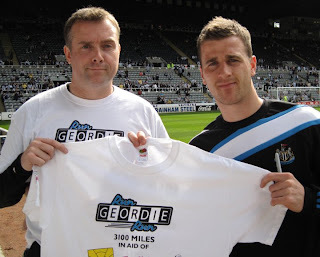 As a result of yesterday's Run Geordie Run t-shirt pre match warm up, the charity fund has surged through the £8,000 barrier and currently stands at £8,368.20. Can I say a huge thank you to everyone who has bought a t-shirt so far. THANK YOU!!!!! I will be posting them all out next week and sending emails of confirmation and thanks. On behalf of St Benedict's Hospice (Charity No. 1019410), The Children's Foundation (Charity No. 1000013) and the team at Run Geordie Run, another huge THANK YOU is on the way to Adidas, Newcastle United and nufc.com for the part they played in organising yesterday's t-shirt warm up. If you would like to order a Run Geordie Run t-shirt as worn by Newcastle United please click here. Whereeeeerrrreeereee has the t-shirt been this week (Part 6)? Seeing Newcastle United perform their warm up prior to today's match against Blackpool was a very proud moment indeed and will hopefully do wonders for Run Geordie Run, St Benedict's Hospice and The Children's Foundation. It was also really really brilliant to watch the team get another 3 crucial title chasing points. The proudest part of the day for me, however, was when I received a picture of 6 year old Haydn Weymes with a Run Geordie Run T-shirt, from his Mum Alyson. Today was Haydn's first ever Newcastle match! Oh and what a first match to attend with Newcastle running out 4 - 1 victors over Blackpool. Haydn has a rare chromosome disorder that has left him severely disabled but thankfully he has a very loving family around him. And it is to the Weymes family that I say a huge thank you for taking the time to take this picture. It really made my day and I think will touch the hearts of the hundreds of readers of this website. Whereeeeerrrreeereee has the t-shirt been this week (Part 5)? When the Mags go marching in. If you would like to order a t-shirt as worn by Newcastle United during today's warm up please click here. Whereeeeerrrreeereee has the t-shirt been this week (Part 4)? going to win the league. Whereeeeerrrreeereee has the t-shirt been this week (Part 3)? Whereeeeerrrreeereee has the t-shirt been this week (Part 2)? Whereeeeerrrreeereee has the t-shirt been this week (Part 1)? Oh Coloccini, I want Curly hair too!!!!! Charity fund almost at £8000!!! Run Geordie Run t-shirt orders have flooded in today thanks to a brilliant bit of publicity on nufc.com. As a result, the charity fund now stands just short of the next major milestone of £8,000. Tremendous! I can't wait to see the lady's face in the Post Office when she sees me with all of the t-shirt parcels next week! 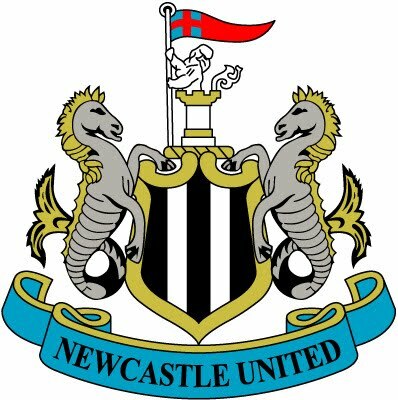 The Journal newspaper will be reporting that the Newcastle United first team squad will be warming up in Run Geordie Run t-shirts prior to the Blackpool match tomorrow. Watch this space for further coverage on that tomorrow night. Run Geordie Run t-shirts as pictured here with Sky Sports's Jeff Stelling are available for £10 each with the FULL £10 going to St Benedict's Hospice (Charity No. 1019410) and The Children's Foundation (Charity No. 1000013). Payment is made via justgiving.com meaning that the money goes straight to the charities. Postage to anywhere in the world is free. Although, I've noticed some overseas folk paying a bit extra to the charities to make up for the fact that I pay for the postage. That's entirely optional though. Thanks once again to all of those very generous people who have bought a t-shirt. If you get the chance, I'd love to publish your photos on this site of you wearing them. Photos can be sent to sponsorship@rungeordierun.com. 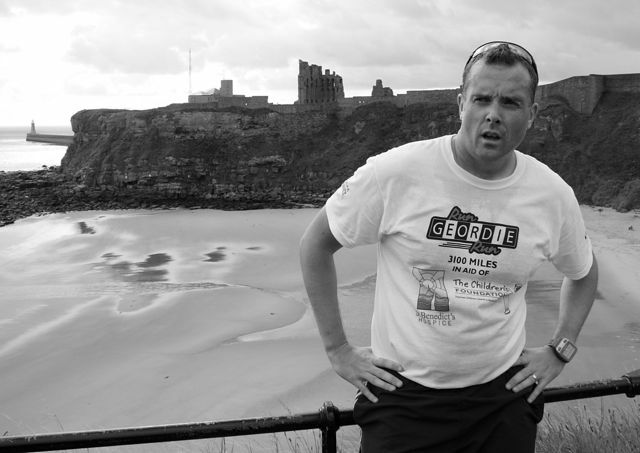 PLEASE CLICK HERE TO ORDER YOUR RUN GEORDIE RUN CHARITY T-SHIRT. I'm currently doing my 6th 16 mile run of the week and I've just heard that there's a great article about Run Geordie Run on nufc.com. 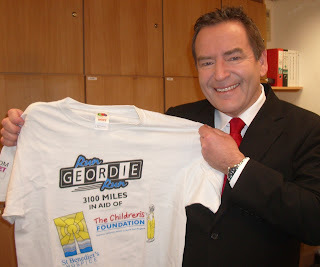 Many thanks to those kind folk who have ordered Run Geordie Run charity t-shirts as a result. The charity fund has almost reached £8,000, which is brilliant. If you would like to order a t-shirt then please click here. At the end of this training run, I will have ran 96 miles so far this week. The wonderful support given to the 2 charites through the sale of t-shirts makes my running so much easier to do. Blimey! I thought the camera was supposed to add 10 pounds not 10 stones! Anyway, although the Tyne Tees article was pulled from the news at the last minute it is available to view online by clicking here. I'm in the running to be seen on North East tonight at 6pm today. and remember the camera adds a few stone! Whhhhheeeerrreeee will the Run Geordie Run t-shirt be this week? I'm delighted to be able to tell everyone that the Newcastle United first team will be wearing Run Geordie Run t-shirts during the warm up prior to the Blackpool game this Saturday. This is a massive coup for Run Geordie Run and will help to highlight the 3100 mile run across the USA and the 2 charities for which it is being done. Not only that, but since I announced the t-shirt warm up on Twitter and Facebook earlier today, the orders have doubled. Almost £3,000 has now been raised from the sale of t-shirts and this has played a major part in helping the fund creep towards the next major milestone of £8,000! 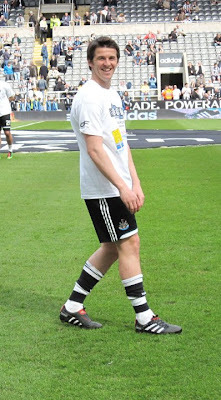 Thanks go to Adidas and nufc.com for helping to arrange the t-shirt warm up. Of course, there will be more news and photos as I get them at the weekend. Watch this space! 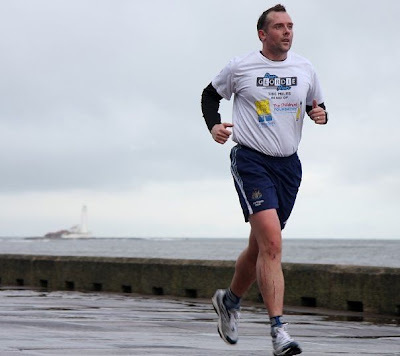 If you would like to order a Run Geordie Run t-shirt then please click here. They are only £10 with ALL of that £10 going to the charities. Oh and postage is free too! While it will be quite something to witness the warm up on Saturday, the real amazing aspect is that I've heard that a certain 6 year old lad called Haydn Weymes will be attending the match. 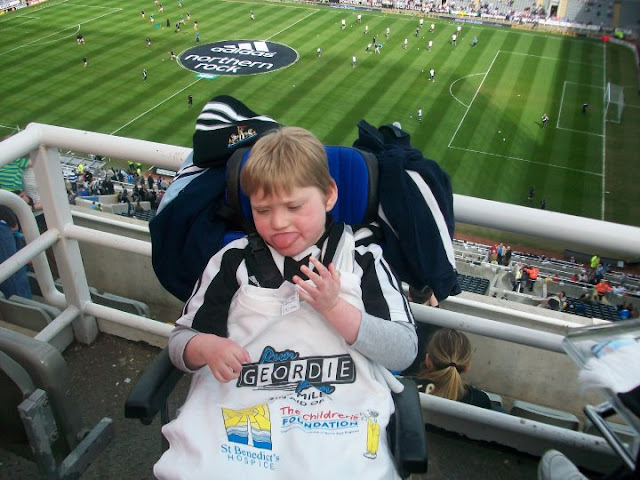 Haydn's Mam, Alyson, tells me that it will be his first game and they will have a Run Geordie Run T-Shirt with them. 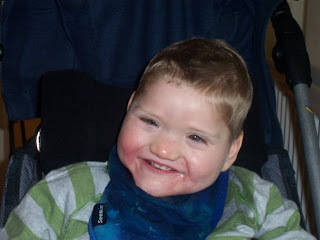 Haydn as a rare chromosome disorder that has left him severely disabled. Alyson says that "he has a million dollar smile when he is happy so if you are feeling a little down in the dumps then let Haydn's magic smile cheer you up!!!!". I'm sure that you'll agree that Saturday's match against Blackpool promises to be very special for so many reasons! Kite spotting on the 3rd 16 mile run of the week. The route for today's 16 mile run was from Shotley Bridge to Rowlands Gill and back. Once again a conservative pace was on the cards given that I've got 7 lots of 16 miles to do this week. This, of course, was the third lot of 16 miles. I set off in near perfect conditions and I must say that I thoroughly enjoyed the scenery in Derwentside this afternoon. 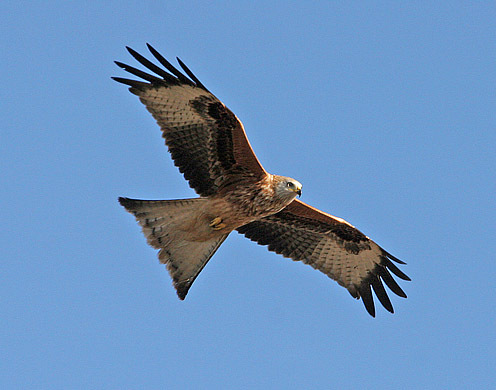 The pair of Red Kites (an example of one is pictured) flying above the trees on the Derwent Walk were simply stunning to see in full flight. The first 8 miles, which were mostly down hill took 01:22:00 to complete. The final 8 miles, which were mostly up hill, took 01:25:42 to complete. I felt comfortable throughout the entire run, once again letting myself slip into the sensible pace that will give me every chance of completing week 74's training in 1 piece. Once or twice I had to hold back as I felt I was able to run slightly quicker. If there's anything I've learned over the last few months though, it is that speed is not going to get me successfully across the USA next year. Having said that, I was a good 16 minutes quicker than yesterday. I think the lack of wind today probably contributed to that. I'll cross over the half way point in training week 74 tomorrow. I'll be splitting the 16 mile runs into 2 x 8 mile sessions over the next 3 days. I may have another crack at running to the match on Saturday. I'll make my mind up on that one nearer the time. For now, though, I'm on track to make this a successful week of training. 48 miles have been done so far in 3 days with 64 miles left to do over the next 4 days. I can't sign off tonight without thanking those folk who have bought Run Geordie Run T-Shirts this week. On behalf of St Benedict's Hospice (Charity No. 1019410) and The Children's Foundation (Charity No. 1000013) THANKS!!!!! The charity fund now stands at a very pleasing £7,575.20. For the record, £6,435.20 has already been paid directly to the charities. The remaining amount of £1,140 is in the form of traditional sponsorship which will be collected on successful completion of the run next year. Now there's an incentive to get to the end! Today's 16 miles were done in one session in very windy conditions. I'm pleased t oreport that The run passed by without incident. 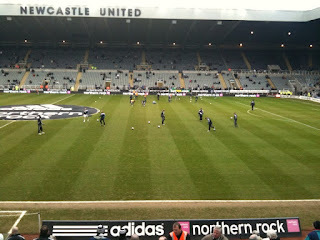 I took my foot off the gas, big time, as I neared St James Park in plenty of time for the match versus Sheffield United. The slower pace will hopefully make tomorrow's 16 miles a bit easier. 16 miles to the best party in the North East! Yesterday's 1st of 7 days of running 16 miles per day was split over 2 sessions. The first of which was the usual 10.5 mile Peter's Pies 6 Tyne Bridges Challenge done in 01:40:01. The second run was a nice easy 5.5 mile stroll from Shotley Bridge to Low Westwood and back in 00:54:03. Today's 16 mile effort will see me run from Shotley Bridge through Ebchester, Rowlands Gill, Blaydon and over the Scotswood Bridge. The final destination will be my beloved St James' Park just in time to watch the lads play Sheffield United and hopefully confirm promotion back to the big time. The stadium promises to have a party atmosphere about it today. Hopefully, the football on the pitch will be worthy of our wonderful support. Howay the lads! In between today's 2 runs totalling 16 miles, I've been busy listing a new item on eBay. As I mentioned last week, I'll be putting some of my prized possessions up for sale in order to help pay for the expenses associated with the run next year. Today, I took the difficult decision of listing a Newcastle United tracksuit top that has been in my family since the seventies. It belonged to my brother David who sadly passed away in 1990. It is from the early part of that decade and was made by Umbro. I'm sure he wouldn't have minded me putting this one up for sale given that it will help pay for the USA tour which in turn will raise thousands of pounds for St Benedict's Hospice and The Children's Foundation. Also listed today was a framed Super Mac autographed photo, a framed Robert Lee autograph with photo, some rare Newcastle United pin badges from the 1970's and a pair of shorts worn by Jonathan Woodgate in 2003. Please click the following links to be taken to the auctions. The plan for week 74. It's hard to believe that I've been in training for the 3100 mile run across the USA for the last 74 weeks. Thankfully, I only have another 54 weeks to go! I've had an easy week 73 following last Saturday's 32 mile run up and down the hills of beautiful Northumberland. Well I say easy! It was a 90 minute personal training session with Mark Fleming. The session itself was far from easy. I was referring to the fact that I've only had one session all week. This has given me a chance to catch up on some route planning and other Run Geordie Run admin. Speaking of which, I've had a couple of offers from various people to help out on that front. I'll be passing some tasks over to the helpers over the coming weeks. This will help me concentrate on running, running and more running. Regular readers will remember that 8 weeks ago I ran 10 miles a day for 7 days. 4 weeks ago I ran 13 miles a day for 7 days. Next week it's time to run 16 miles a day for 7 days. 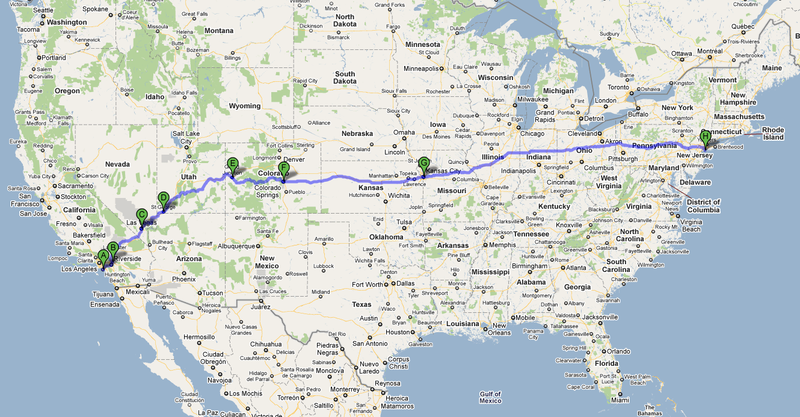 This, of course, is all part of my build up to the typical weekly USA mileage of 32 miles a day. The running itself should be pretty straightforward. As ever, trying to balance attending Newcastle matches, family life, work and Run Geordie Run admin is going to be a challenge. It's a nice challenge to have and I won't for one minute complain about it. Watch this space next week for my progress. It's 112 miles in total over the next 7 days. It will be the longest distance I've ran since John O'Groats to Lands End back in 2007. I'm very much looking forward to it! Friday 3rd April - Personal Training Session. (01:30:00). It's common knowledge that I'm paying for the USA trip out of my own pocket. I've already got funding in place to pay for the accommodation and some fuel costs, having saved furiously for the last 2 years. In order to add further cash to my tour fund I've decided to sell some of my prize possessions on eBay. Items will include Paul Gascoigne's last ever competitive match worn shirt, a tracksuit worn by Kevin Keegan, some player worn Newcastle United training kit, various signed memorabilia and some Team GB kit. None of these items were available to buy in the shops and will hopefully boost by tour fund. I'll be listing the items over the coming days starting today with a Team GB Paralympic Games t-shirt from Athens 2004.